The second round of the Swedish premiership (the Allsvenskan) last weekend saw African players continue their scoring form. Midfielder Rene Makondele Muzola hit the consolation in the 83rd minute as his side, BK Hacken went down 2-1 to Elfborg in a pulsating affair. This was the Congolese first strike in the new season. Atvidaberg’s Ghananian striker Mohammed Abubakari was on the score sheet again when he opened the scoring against Kalmar in a 2-all draw while Liberian forward Dioh Williams raised the curtain ( his second in the two weeks old season) in the 50th minute but that was not enough as his team Gefle went down 2-1 to AIK. Nigerian hitman Kennedy Igboananike provided the AIK winner four minutes to the end. Djurgarden recorded an emphatic 3-0 victory over Halmstad in a match which saw Gambian striker Amadou Jawo scored the third goal in eleven minutes from time. The lower rank, the first division, kicked off last weekend. Nigerian Salisu Abdullahi Gero scored in the 69th minute as Oster overpowered Angelhom 4-1 while his compatriot Moses Ogbu was on the score sheet for Sirius in a 5-1 trashing of Syrainska. 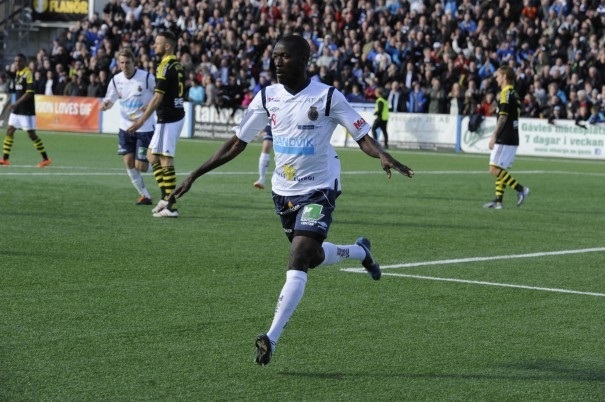 Gambia’s Pa Amat Dibba scored theonly goal in the 70th minute as GIF Sundsvall pipped Jonkoping 1-0.